In 2006, when Oregonians noticed the devastating impact payday and car-title lending was having on their communities, a coalition pushed for a change in the state laws, bringing new consumer protections to hundreds of thousands of people in the state. This example shows the power of communities to make change on issues affecting the day-to-day lives of people in Oregon. Today, community organizations are once again coming together to continue improving the marketplace and economic security for working families in the state. 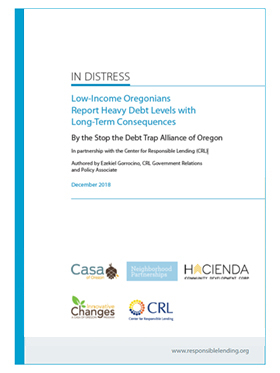 Through the newly formed Stop the Debt Trap Alliance of Oregon, and as part of the efforts to dig deeper into the debt burden experiences of low-income Oregonians, a number of nonprofit organizations developed a survey to be used as part of their intake processes. The survey was distributed in the spring and summer of 2018 with the goal of understanding what debts low-income families were facing, what had triggered that debt, and how these families were managing their debt loads. After reviewing over 400 responses from individuals in over 100 different Oregon zip codes collected by 10 different social services organizations, the results were startling: low-income Oregon families are carrying various debts that have long-lasting implications in many aspects of their lives. From medical and utilities debt, to payday loans and student loans, all of these debts can lead to debt collection and credit reporting and are holding families back from successfully building wealth and achieving a life of financial security. The surveyed households are very low-income, with a median income of $20,000 to $30,000. A third of them are earning $20,000 or less in a given year. Most of the people surveyed identified as White, female, employed, and in their 30s, but there was also a significant number of people of color, as well as part-time and/or occasional workers. More than half of the people reported that they or a family member has outstanding student loans. One-third of the individuals with student loan debt reported that they are behind on their monthly payments, and more than half reported postponing a large purchase, such as a car or house, because of these loans. Among the many outstanding debts that people are carrying, one in two carry credit card debt, one in four have car loan debt, and one in 10 have utility debt. One out of every three people reported that they have been contacted by a debt collector in the previous year, with a third of them finding mistakes in the debt records received from collectors. More than two-thirds did not receive original documents of the debts, and a third reported being sued for their debts, making these families jump through hoops to fight a debt that may not be theirs or is for the wrong amount. One out of every four people surveyed have used a payday or car-title loan in the past year. A full quarter took out more than one payday loan at a time, putting themselves at risk of getting trapped in a cycle of debt and highlighting payday lenders’ evasion of a requirement in Oregon law to provide a seven-day cooling-off period between each loan.